It all starts with ‘Blockchain’ technologies…The second most confusing phrase in the English vocabulary after ‘Bitcoin’. Blockchain technology is the basis by which Bitcoin, all those other cryptocurrencies and Smart Contracts work. No doubt you’ve heard these terms being tossed around at EVERY SINGLE social gathering you’ve been to in the last 12 months. Most people have a vague idea of what they are and how they’re related, and we’ve all heard the stories of that friend of a friend of an uncle who’s made millions from Bitcoin, but is all of it just a silly fad or the ultimate evolution in financial and contractual technologies? Many would suggest that the latter is true, and that’s why you need to know about it. Blockchain technology is an undeniably ingenious invention that has the ability to (and almost undeniably will) reshape the world as we know it. One industry in particular that will be turned on its head is the construction industry. Currently, there are just too many problems in the two above-mentioned areas to list and these problems contribute to construction projects that are delivered past deadlines, over budget and/or which end in lengthy legal battles over contractual disputes. Invoice processing and financial transactions are SLOW. It can take months for invoices to be approved and days or weeks for the funds to be processed or to change hands. Project status reporting is often delayed and subject to interpretation. Contractual agreements are regularly subject to arguments and disputes. Tracking of goods and materials is difficult and often subject to human error. Blockchain technology and Smart Contracts can solve all of these problems and more. The evolution of Blockchain technology and Smart Contracts is currently said to be comparable to the evolution of the internet in 1989. Think about that for a second…This was a time when most people didn’t even own a computer and the internet was limited to a few thousand web pages. Since 1989 we’ve seen the creation of high speed internet, gigantic information directories like yahoo and Google, social media platforms that we now can’t imagine life without and the ability to shop online for absolutely anything. We’ve also seen the evolution of computers from being the size of an entire room to now being thousands of times more powerful and able to be carried around in our pockets. 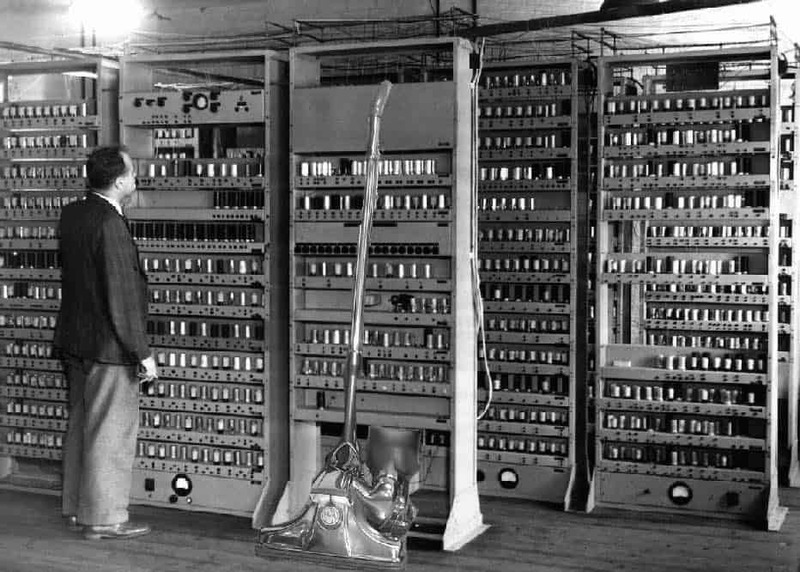 Check out the image below showing the world’s first computer…It’s literally the size of a room! So now that I’ve got your attention, know that Blockchain technology is said to be capable of doing for transactions and contracts, what the internet has done for information, to the extent that in 5-10 years’ time, all financial and contractual systems will be unrecognisable. So, if you don’t know already, here is a quick explanation of blockchain technology and how it works. What is a Blockchain technology and how does it work? While the evolution of internet has allowed us to advance in so many ways, it still has a huge number of pitfalls… Primarily the lack of PRIVACY and SECURITY when sharing your personal information and the lengthy time at which it takes to process transactions. I’m talking about hackers and cyber-criminals who can steal your money, identity and learn everything there is about you with only a few clicks. Also, any financial transactions that you make need to be reviewed and approved by a third party i.e. the bank and this makes them incredibly SLOW. So, when you swipe your card to purchase your morning coffee, the transaction is recorded and sent to the bank who must clear the funds for release. The whole process takes about 3 days before the money is actually in the vendors’ account and it can be up to 2 weeks if we’re talking international transactions. Banks of course love to charge us hefty fees to do all of this for us. It’s the same idea when materials and finances change hands during a construction project. It’s a tediously slow process and there is always a third party required. Blockchain technology solves these problems because each Blockchain is effectively a shared, distributed ledger (record book) where transactions or sharing of information is recorded and confirmed as being absolute and true. The most important part is that once any transaction is recorded and entered into a blockchain, it can never be altered, thus solving the privacy and security issues. Transactions on a blockchain also occur almost instantly and don’t require a third party or bank to process the transactions. This means no bank fees or waiting around to receive funds. Blockchain technology was originally developed to process and record transactions of cryptocurrency (primarily Bitcoin) such that people could buy and sell ‘value’ with anyone else in the world in a few seconds… Bypassing the rules, regulations, security/trust issues and snail-like speed of banks. However, this is only scratching the surface of the capabilities of Blockchain technology. So now that you’ve got an overview, let’s dive into it in a bit more detail. How is it that a Blockchain can never be altered? Blockchains are made up of multiple ‘Blocks’ which are tied together via cryptographic code, hence the name Block-Chain. Each ‘block’ is made up of a series of transactions. So, when Company A makes a transaction with Company B, the transaction is added to a block. Each block can only hold so many transactions and when it reaches its limit (it might be anywhere from 100 to 10,000 transactions depending on the particular Blockchain being used), the block gets verified as being accurate and true and it’s added to the ‘Chain’. When a block fills up, a cryptographic code (usually 64 digits long) of numbers and letters called a ‘hash’ is generated. The hash code is generated using the transactions within the block and therefore is specific to that one block. If anybody were to change even ONE SINGLE digit of a transactions within a block, the resulting cryptographic hash would be completely different. The most important element of a Blockchain is that each block also contains the hash code of the previous block in the chain. This way, if anybody were to change any transaction within the blockchain, the hashes of every block following it in the chain would become invalid. Oh wait, there is…Smart Contracts. What exactly is the purpose of Smart Contracts on a construction project? On a typical construction project today, the principal or developer is initially required to engage a project manager, then depending on the chosen contractual hierarchy, the project manager would procure and engage the architect, design consultants, builder and any other required parties. This hierarchy of course differs from project to project but let’s stick with this for now. The problem with this current system is that any one of the 5 contracts shown above can be lost, forged, hacked, tampered with, fall into the wrong hands or be dishonoured. Also, whenever any type of claim is made (financial or non-financial), it must be manually checked against the specific contract before it is paid. However, all of these problems can be solved using Smart Contracts. Just like how Blockchain technology allows people to trade cryptocurrencies by recording all of the financial transaction quickly and securely, Smart Contracts are Blockchains specifically designed to store and implement contractual information in the same way. More so, Smart Contracts not only define the rules and penalties around an agreement in the same way that a traditional contract does, but also automatically enforces those obligations. Smart Contracts essentially protect all parties who sign them by ensuring that the other parties abide by the agreement. Also, because Smart Contracts use Blockchain technology they cannot be lost, forged or changed, they provide each party a significantly greater security than conventional contracts and they also do not require a ‘middleman’ to execute the contract. Let’s say that the developer engaged a project manager who had the knowledge and ability to implement Smart Contracts. The project manager would draw up the contracts for each of the parties in conjunction with the developer. Each clause of the contracts would have a required action and/or outcome, a deadline for that outcome and a penalty for not meeting the outcome. 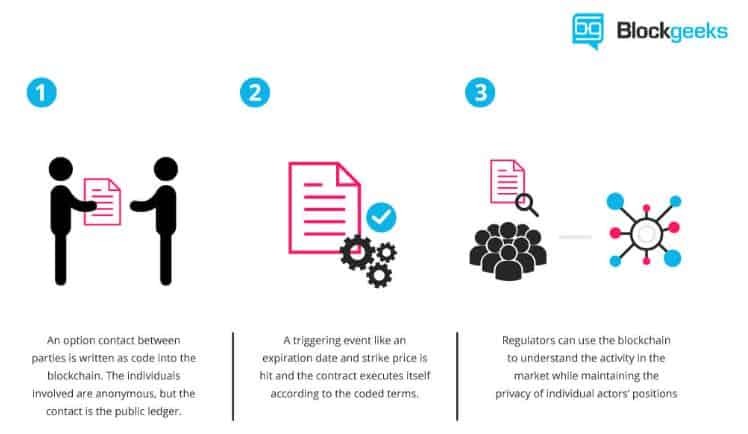 When each party agrees to the contractual conditions and signs it via a digital signature, the contract would be encrypted using a hash code and transferred to the Smart Contract Blockchain where it becomes immutable, true and where it cannot be tampered with. As an example, the builders contract might state that the project is to be completed by a particular date and if that deadline was not achieved for reasons X, Y and Z, the builder would be liable to pay $1,000 per day in damages to the developer for lost income (or the equivalent in cryptocurrency). Let’s say that the builder did miss the project completion deadline by 20 days and was therefore liable to pay the developer $20,000 in damages. With today’s conventional contracts, the developer and project manager would be required to lodge a claim against the builder for those damages, a process which could take months. The builder might decide to dispute the claim in which case there would likely be a draw out legal battle. However, because the project manager had implemented Smart Contracts on this job, as soon as the builder missed their project completion deadline, the relevant clause in the Smart Contract would be triggered and automatically start deducting $1,000 per day (in the form of cryptocurrency) from the builder and immediately transferring the funds to the developer such that the conditions of the contract were implemented in accordance with the initial agreement. There would be no need to claim damages or engage in a legal battle with the builder, the Smart Contract takes all of those issues out of the equation. Using the same logic, every project task would be entered into the smart contracts ledger and upon completion would trigger the sequential task. This would allow all relevant stakeholders to view the projects progress in real time. Every financial transaction would be triggered by certain events and implemented in accordance with the contract such that there could never be any dispute. Every time a supplier delivered materials for the project the exact quantities and details of those materials would be entered into the ledger…And so on. On any construction project, it’s the project managers primary role and responsibility to create, validate and implement financial transactions and contractual agreements between all respective parties on behalf of the principle. A project manager who can implement Smart Contracts will be able to offer SIGNIFICANT benefits to the principle in terms of time and cost savings and security. Today’s Construction contracts are extremely complex and often subject to confusion, misinterpretation and dispute. Transferring them into Smart Contract format such that they can be implemented by everyday people with total trust and understanding is realistically still several years away. However, Wildara intends to be the first project management firm in Australia to implement a Smart Contract.